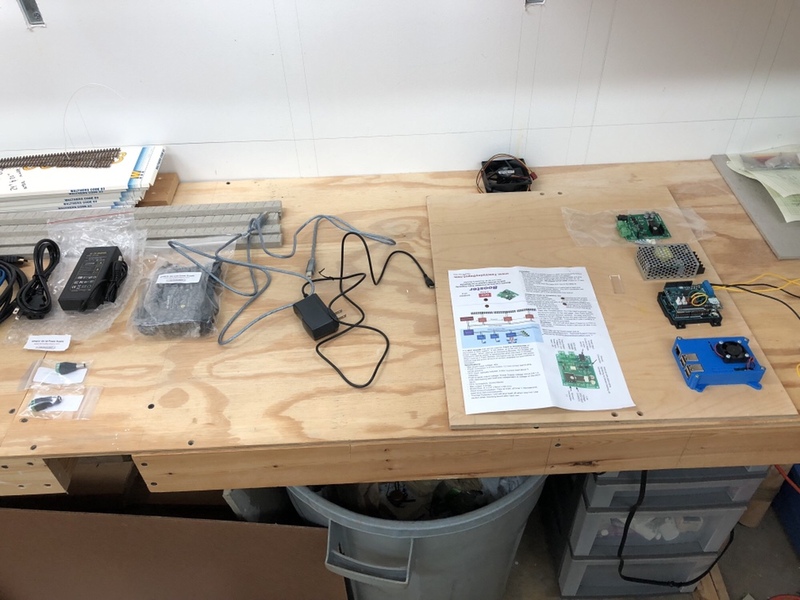 The prototype DCC system is up and running. 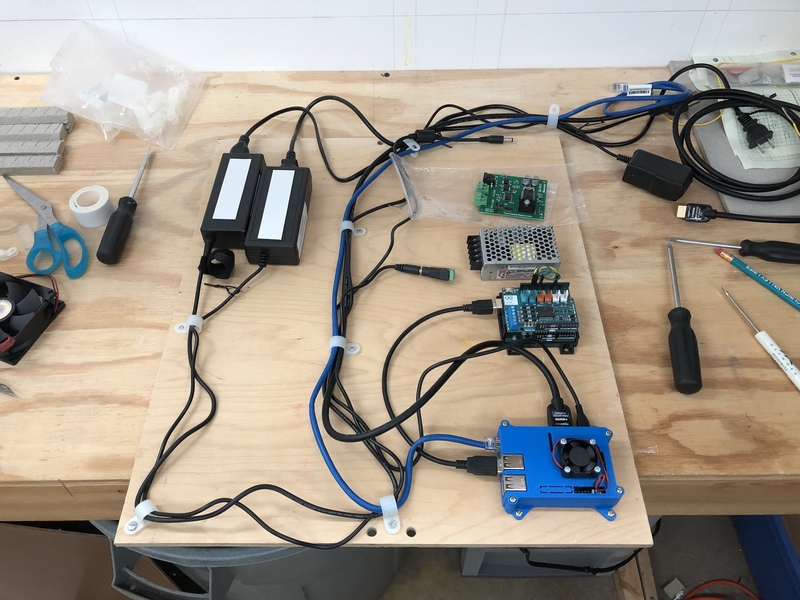 I decided to home brew my DCC when I read about DCC++ and realized I had an Arduino laying around with no real purpose. 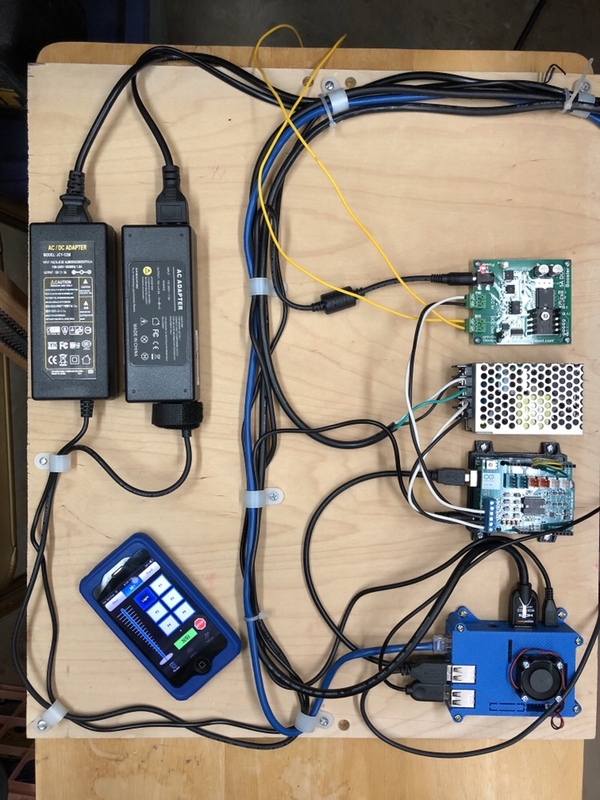 I bought a motor shield and hooked up my laptop and an old power pack to test it out. It worked but I knew I had to come up with a more complete and permanent setup. 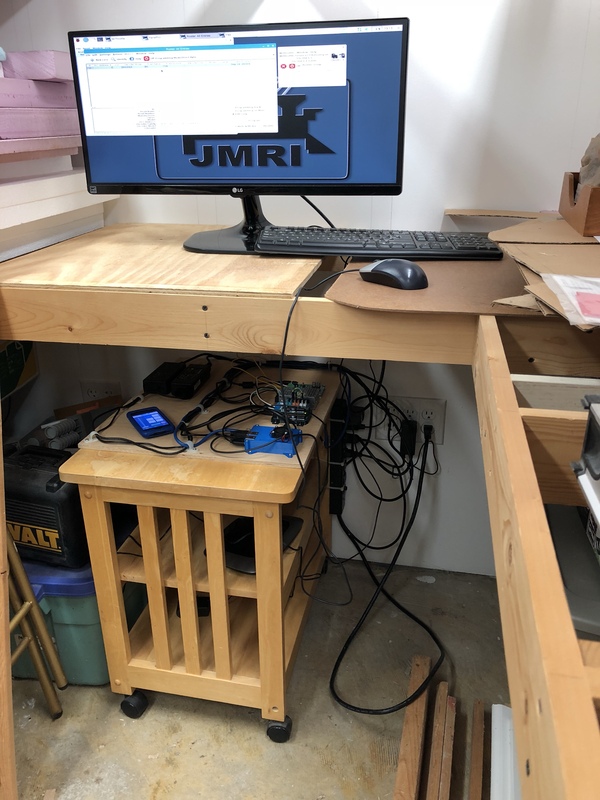 I immediately considered the Raspberry Pi (RPi) as it’s a low cost, full featured Linux computer and I can run JMRI on it! I needed a power supply and a bit of research found others doing similar things using various inexpensive devices. I also wanted a proper booster so I chose a Tam Valley unit. I’ll invest in a second one for my other power district in the future. 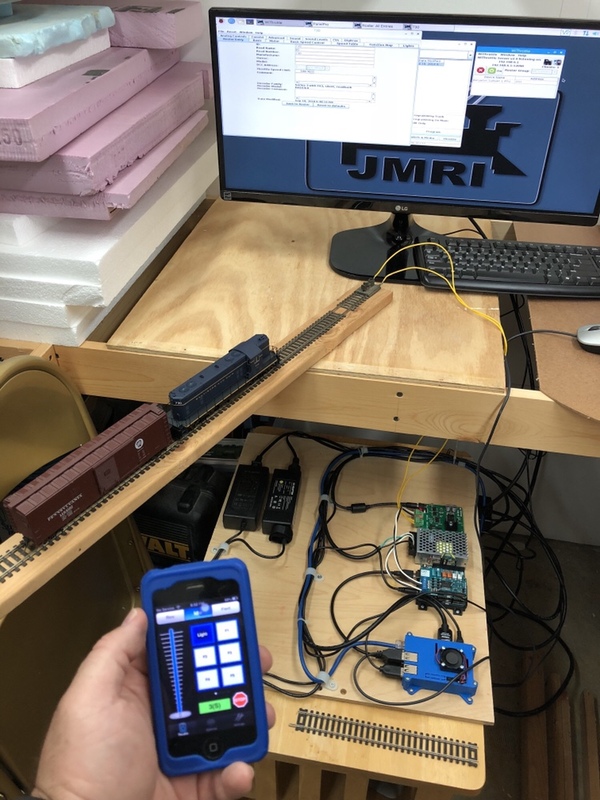 EDIT: I used Steve Todd’s “JMRI RaspberryPi as Access Point” which is a pre-built configuration for RPi which sets it up by default as an access point, connects to the DCC++ system and runs PanelPro, etc. It’s fantastic and worked right away. Today I spent several hours putting all the pieces together that I had collected over the last couple years. The monitor was a donor from my dad. The mouse, keyboard and cabling was all old stuff laying around. I put everything onto a board, first laying it out and planning the cable routing. Once everything was good, I screwed the pieces into place. Next was to test voltages and see what worked. A bit of tinkering and everything looked good. I set it all in place and started configuring things in the RPi. A bit of trial and error getting things to talk to each other, with some luck, and it’s working! There are still lots of kinks to work out and I need to experiment with a lot of the features. My intention is for this to be a fun project and provide a robust DCC system to get me started for the Georgetown Branch. We will see how it works in the long run. 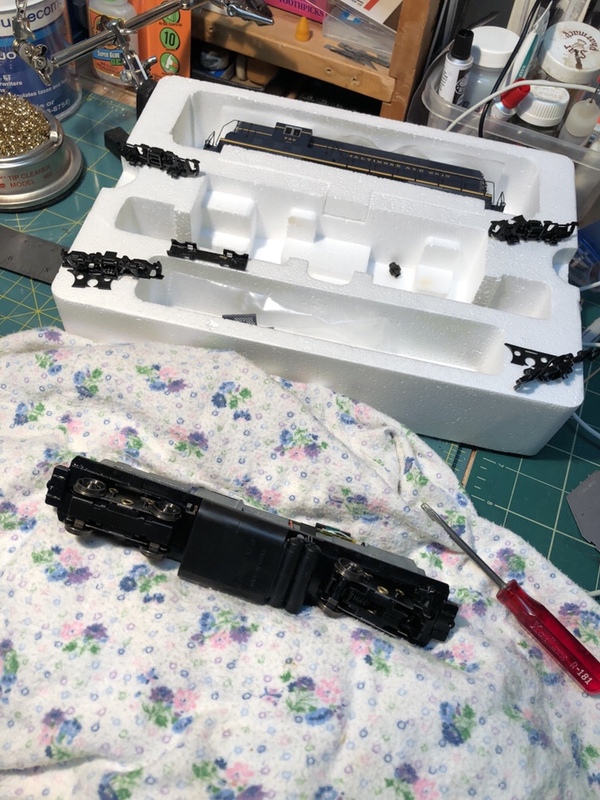 incidentally, I had planned on taking apart my Proto2000 GP7 to have a look at the plastic gears, as last time I ran it it was making lots of noise. 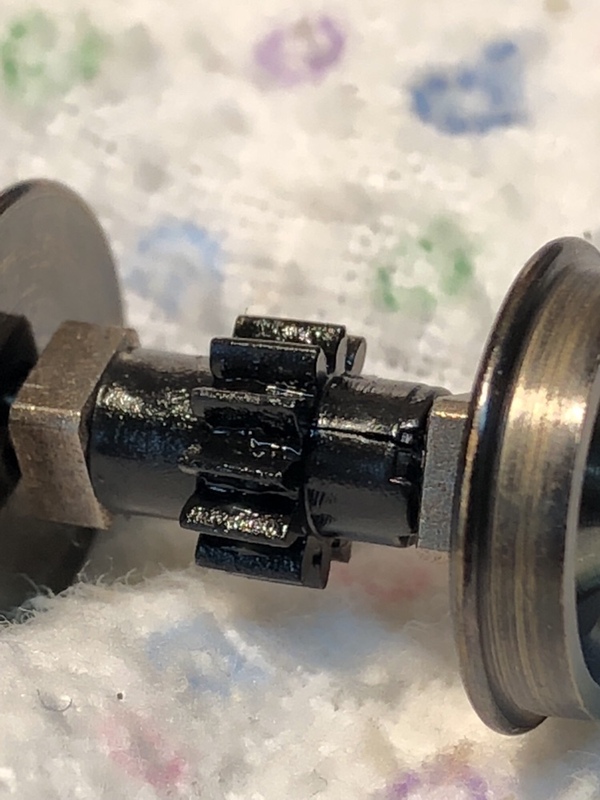 I was asked to give some more details about parts and prices. I’ve created a spreadsheet and pasted the data here to give you a rough idea. Building this setup requires many things that you probably already have on hand, so the cost will vary. Also, you can find things on sale occasionally and you can simplify or streamline it with your own skills or modifications. I included rough estimates for a few things which you will need just to get the ball rolling. Feel free to reach out with any questions you have! Arduino Uno Rev3 https://www.amazon.com/Arduino-A000066-ARDUINO-UNO-R3/dp/B008GRTSV6/ref=sr_1_3 $18.16 1 $18.16 You can purchase off-brand if you like. Arduino Motor Shield Rev3 https://store.arduino.cc/usa/arduino-motor-shield-rev3 $22.00 1 $22.00 You can purchase off-brand if you like. n/a Jumper wires http://www.microcenter.com/product/486586/26awg-m-m-jumper-wires—20-pack $4.99 1 $4.99 Can also use solid 26 AWG wire, or similar. Raspberry Pi Pi 3 Model B http://www.microcenter.com/product/460968/3_Model_B?src=raspberrypi $34.99 1 $34.99 You can upgrade to the B+ if you want Bluetooth, etc. n/a Pi 3 case n/a $9.00 1 $9.00 You can select any that you like. Raspberry Pi Pi 5V 2.5A power supply http://www.microcenter.com/product/483715/official-5v-25a-power-supply—black $10.99 1 $10.99 You can purchase off-brand if you like. n/a AC Computer Power Cable https://www.ebay.com/itm/3-Prong-Pin-AC-Power-Cord-Cable-for-PC-Desktop-Computer/112999388247 $2.49 1 $2.49 To power AC-DC power supply. Verbatim keyboard http://www.microcenter.com/product/459324/slimline-corded-usb-keyboard—black $4.99 1 $4.99 Any USB keyboard should suffice. Verbatim mouse http://www.microcenter.com/product/488018/corded-notebook-optical-mouse—black $3.99 1 $3.99 Any USB mouse should suffice. HP monitor http://www.microcenter.com/product/485576/la1956x-19-sxga-60hz-vga-dvi-dp-led-monitor-refurbished $39.99 1 $39.99 Whatever you can find; simpler, smaller the better. n/a wire n/a $6.00 1 $6.00 Various wire to connect components. 3M 3M Scotch 114/DC Heavy Duty Mounting Tape https://www.amazon.com/Scotch-Indoor-Mounting-1-Inch-125-Inches/dp/B00004Z4A8/ref=sr_1_4?s=hi&ie=UTF8&qid=1537809806&sr=1-4&keywords=3m%2Bdouble%2Bsided%2Bfoam%2Btape%2B1%22&th=1 $6.00 1 $6.00 Use any mounting tape.